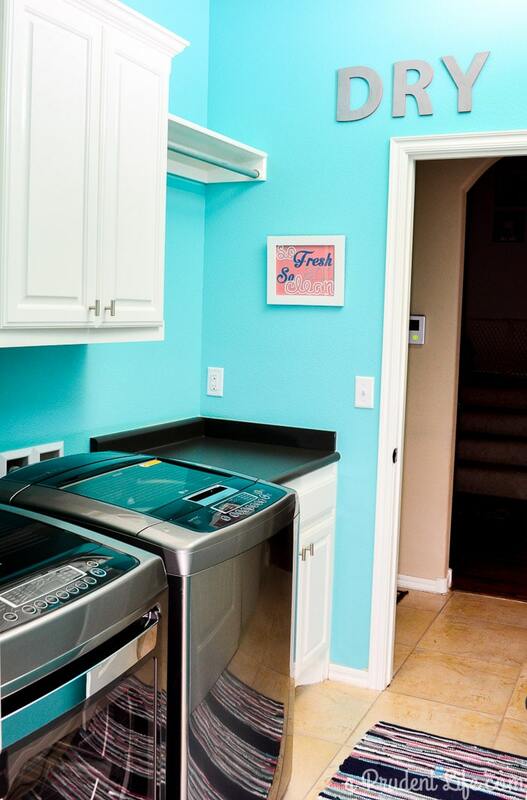 Well friends, it’s time for the grand finale in the laundry room makeover series! Have you been following the first 3 posts in the series? 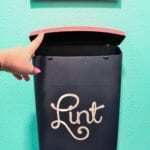 The lint bin has been a huge hit! There was nothing truly “wrong” with the room before other than disorganization & blandness. And you know what DOESN’T make a room exciting? Doing laundry. To counteract the blah involved in washing clothes, I knew I wanted to go bright in this space. 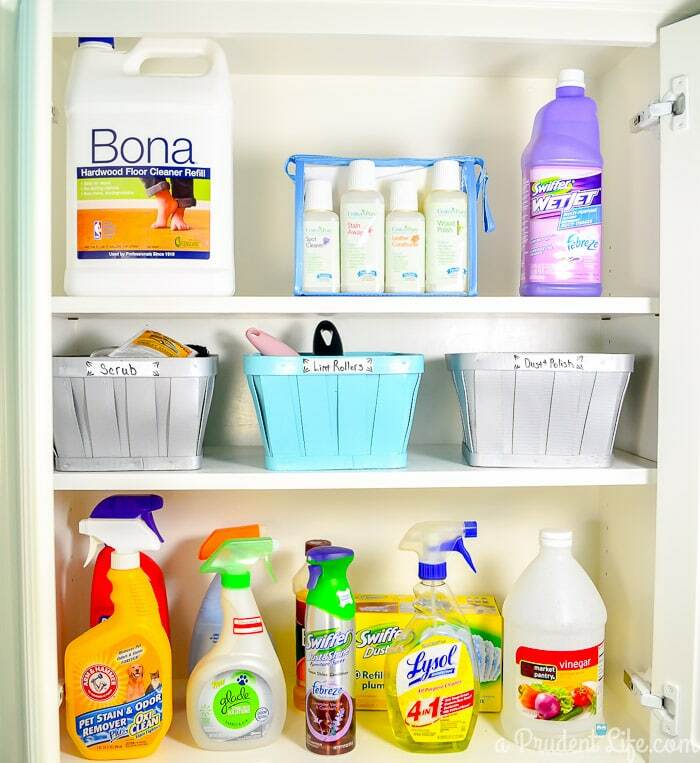 Before I started, I set a budget of $100 including paint, a rug, decor & organizational bins. My inspiration piece for the room was this great rug from Target. I loved the colors, the size, and the price – $16! 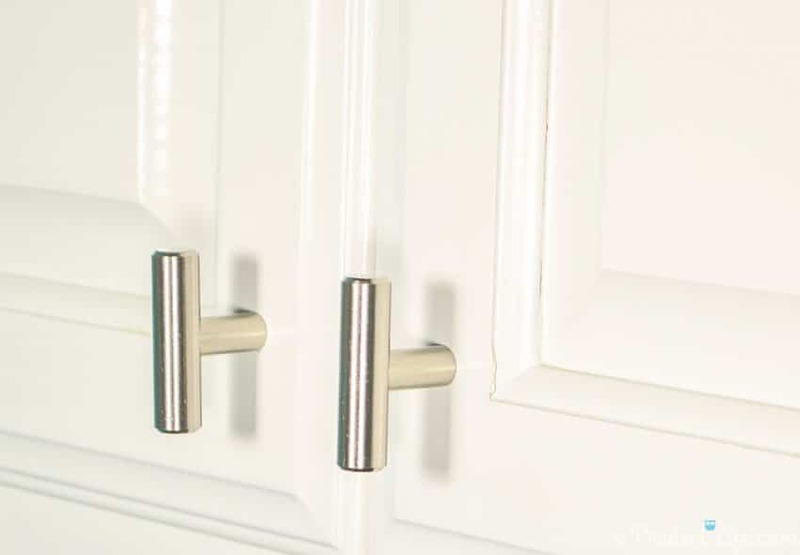 Did you notice the new cabinet door hardware? Take a peek at it, then scroll back and compare to the before picture. The cabinets look so much more finished now. I was shocked at the difference. I got the pulls from D. Lawless Hardware with a gift card I received at the Haven Conference. BUT, they are super affordable for anyone. The ones I picked (here) were only $1.99 each. I’m kinda in love with them. 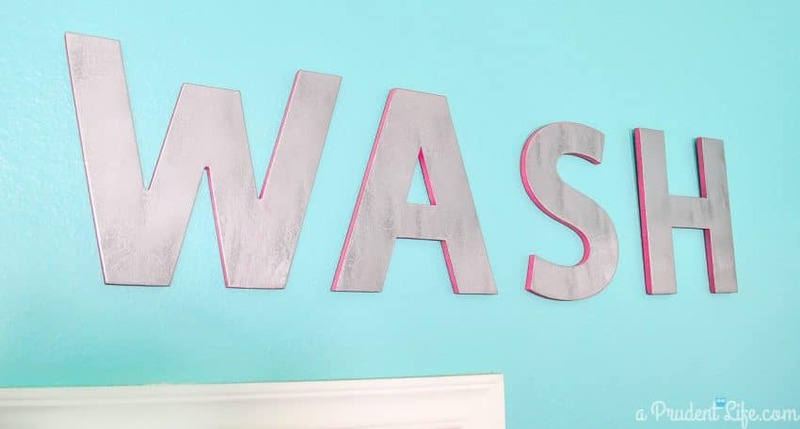 Speaking of love, I’m obsessed with my big WASH letters. They are just cheap chipboard letters from Hobby Lobby ($1 each during the 50% off sales). I sprayed the front with hammered metal paint, then trimmed the edges with pink craft paint. From the other direction, you can see the coordinating DRY letters. I made the So Fresh and So Clean printable when I needed something else for this wall. Both printables are in old frames that I painted with leftover trim/cabinet paint. I’m learning how handy it is to have leftover paint that matches all your cabinetry! The lower cabinet in the above picture is our new pet station. Click the photo below to see the full post about it. The room is pretty narrow, so my options for the back wall were limited. 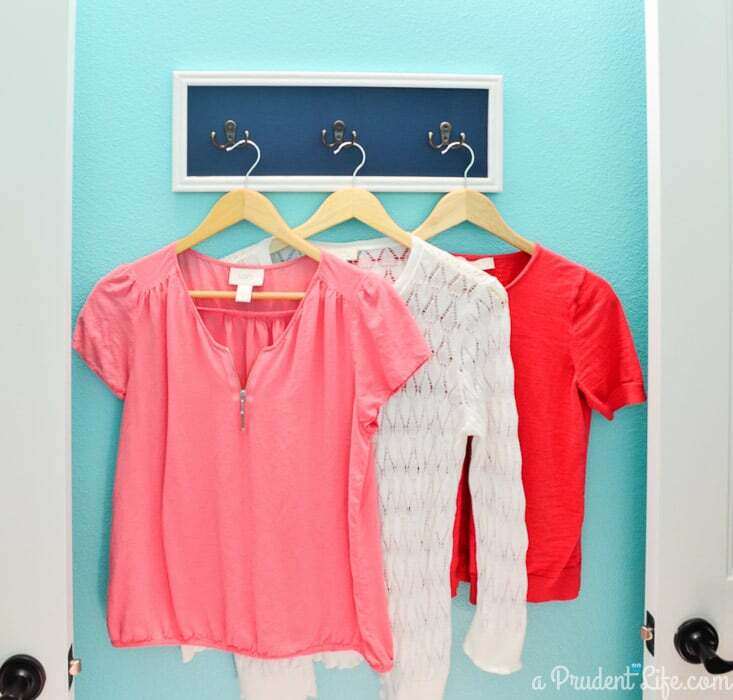 Several months ago, I found a red argyle triple wall hook system at Hobby Lobby on clearance for $4. Even though it didn’t match anything in our house, I knew I could give it a makeover. I used the same white trim paint on the frame, then covered the red argyle with navy linen card stock that I found in my craft stash. The new hooks fit perfectly between the doors. The scariest part of the room before was hidden behind the cabinet doors. The only thing we routinely used out of the left cabinet were the dog’s heart worm pills & the light bulbs. Everything else was junk, most of which could be totally purged out of the house. 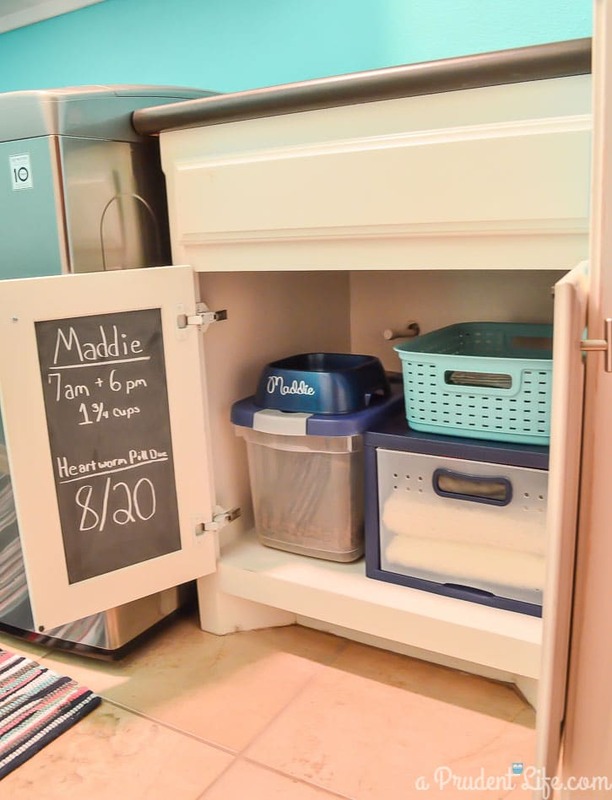 The pills & a few other Maddie items were moved to the new pet cabinet, and the light bulbs were organized into three separate bins. They were moved to the right side cabinet. That meant I had a whole empty cabinet to turn into a cleaning cabinet! That kinda makes it sound like the cabinet actually cleans things. Wouldn’t THAT be nice? 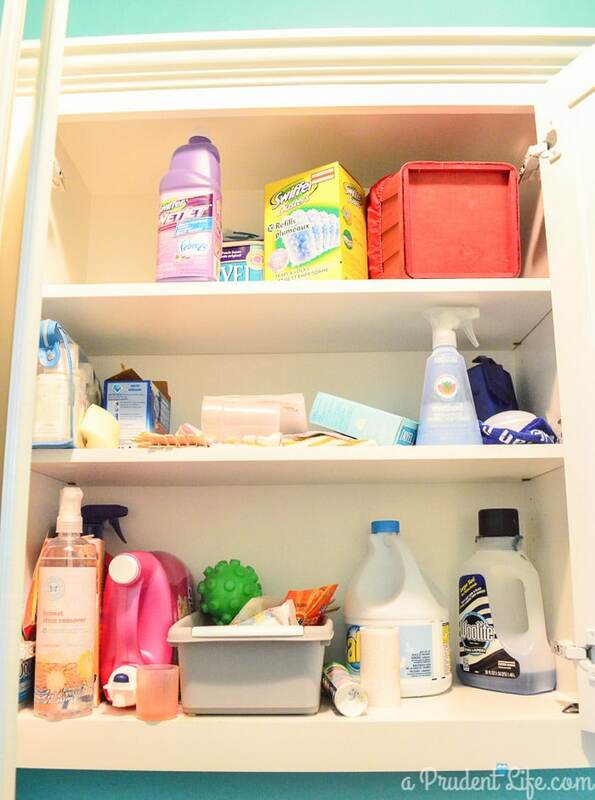 Most of these are the supplies that got kicked out of the kitchen when I did the under sink organization. I’m gradually switching to more natural/homemade cleaners, but have some stock we’ve been using up. On that note, feel free to send me your favorite DIY cleaner recipes! The bins on the middle shelf were clearance red & green holiday baskets from last year. You’ll see a red one in the next before shot. I already had some teal & silver spray paint, so the baskets were another free part of the room. The labels are scrap dry erase vinyl from my menu board. Here is the right side before. It had all the laundry supplies, random cleaning supplies, and those baskets I mentioned. Now all the laundry supplies are on one shelf! You can’t see them in the pic, but the laundry pod bin actually has loose Honest pods in it. We just reach in and grab one to throw into each load. The pod basket was about the only functional part of the room before. 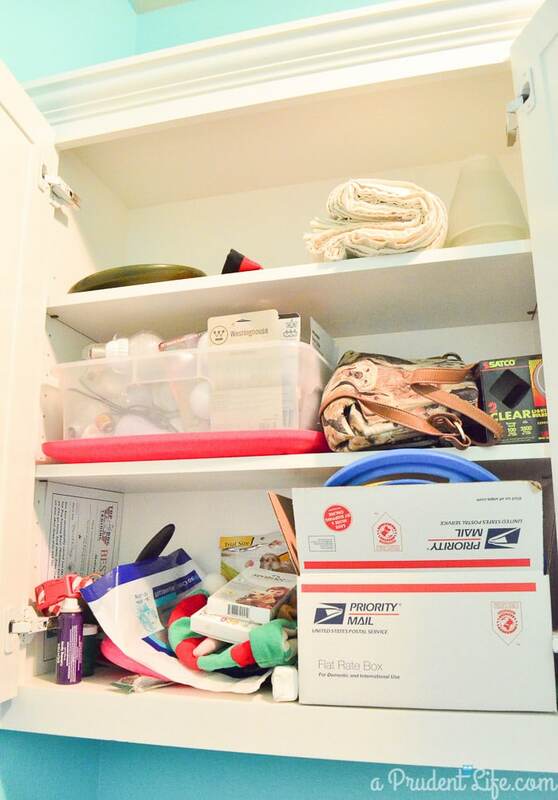 The second shelf now has a key part of every laundry room – a lonely socks club basket! How the heck do socks get so separated and where do the missing ones go? It’s gotta be life’s greatest mystery. The clear tub is the one that the light bulbs used to be in. I cut a quick label for it with some silver scrap vinyl. I also had room for the lingerie washing bags on the second shelf. The top shelf is now home for all the light bulbs. 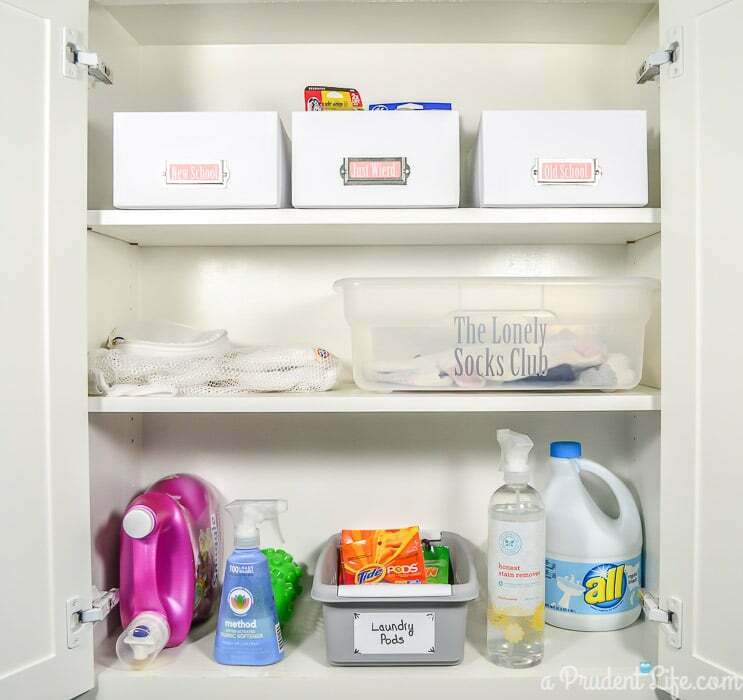 I used photo boxes (no big surprise there if you’ve read my other organizing posts, like the bathroom closet). I LOVE these boxes because they are a great size and CHEAP when Michael’s has them on sale. I separated the light bulbs into old school (incandescent), new school (fluorescent & LED), & just weird (random bathroom/ceiling fan bulbs). And yes. I totally spelled weird wrong on the label. I might fix it eventually. Maybe. I am thrilled to report I came in under budget for the makeover! Love how this turned out. So bright and cheery and face it, laundry isn’t always that way. Ha Love the color and fun decor. Thanks for sharing. I absolutely love this makeover, even though I’m clearly late to the party. 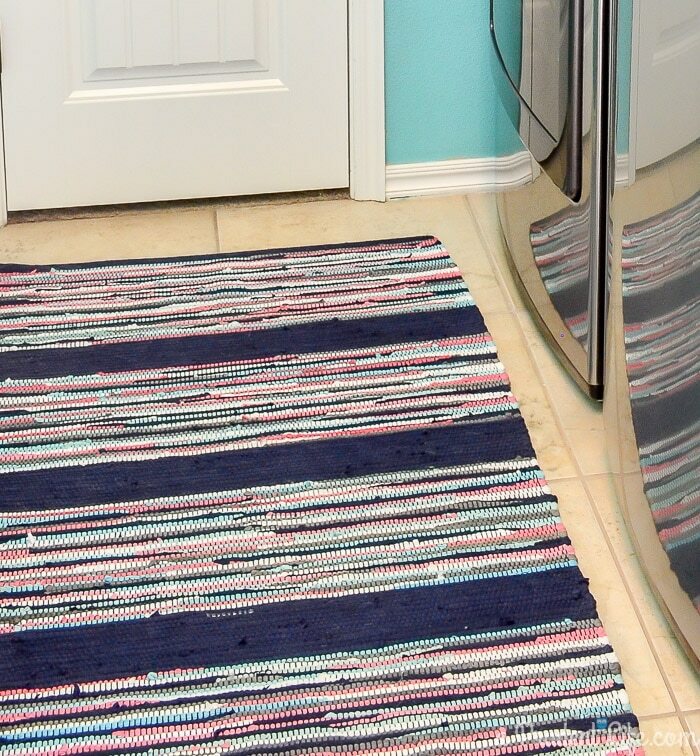 Do you happen to have a link to find the Target rug, or possibly a brand name? I’m hoping to get it for my laundry room. Thanks!! I absolutely LOVE this room…I fell in love with rug and of course its prob gone now!! 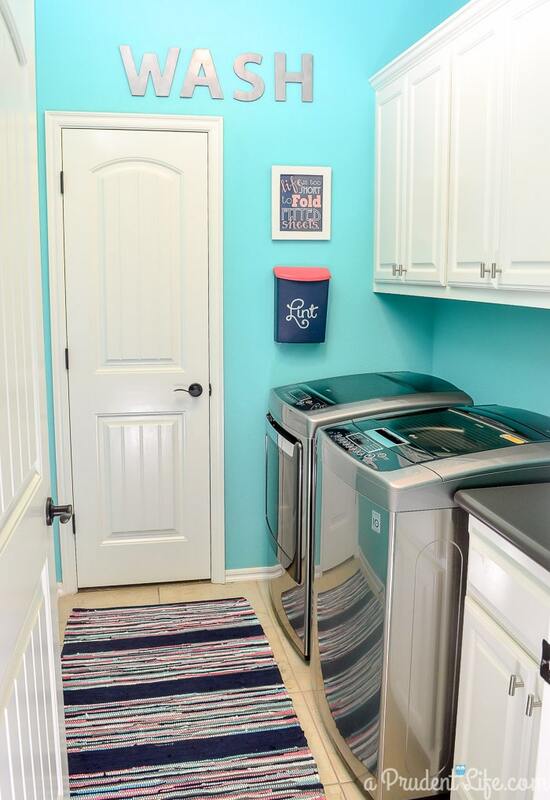 This is such a cute laundry room. I’m curious about the house layout what is behind the other door? Hi Mylene, I’m so sorry if this is a duplicate reply. I thought I had answer but your comment just popped up like I never addressed it. 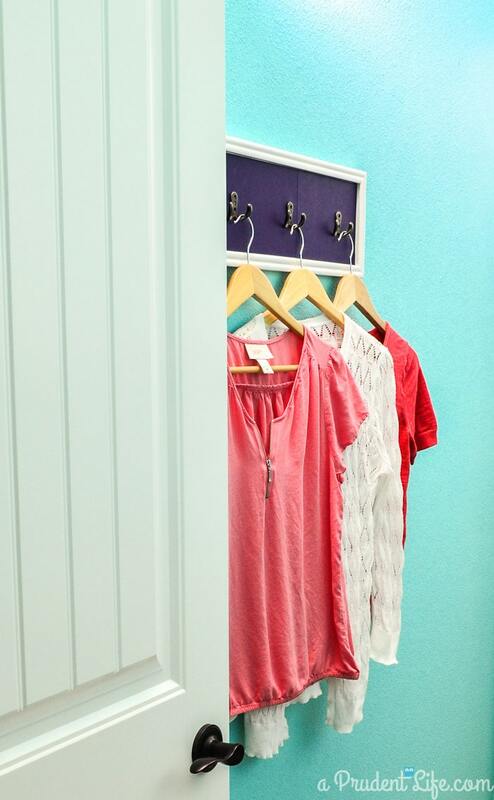 Here’s a post that has the floor plan in it – http://www.polishedhabitat.com/2015/skeletons-in-my-closet-organized-glam-master-closet-week-1/. The other side of the door is our master closet (which I just renovated and reveal here: http://www.polishedhabitat.com/2015/master-closet-organization/ ). Thanks for reading! Awesome job! Thanks for including the budget breakdown. That makes it seem so doable. Thank you! I’m glad the budget breakdown was helpful too! 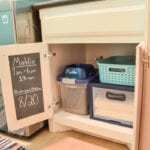 The inside of that cabinet is brilliant! I ALWAYS forget when I last gave my dog her heartworm medicine haha! What a great transformation. 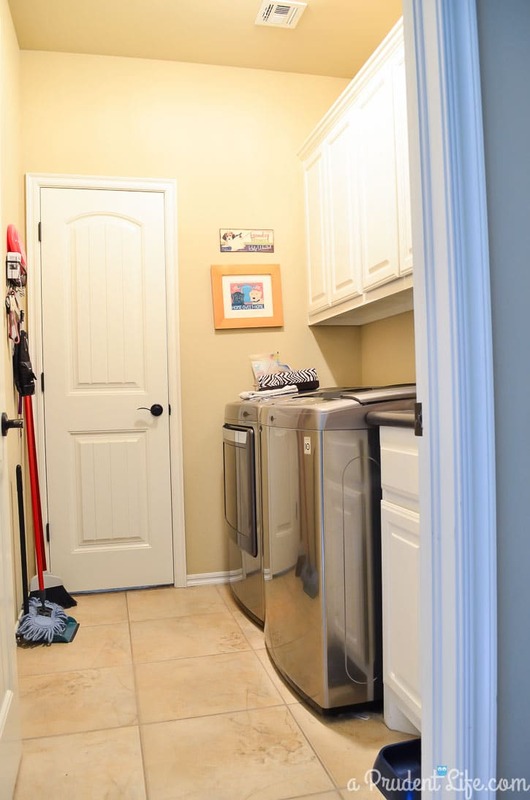 I want to fix up my laundry room! Thank you!!! That chalkboard door has been SO helpful!